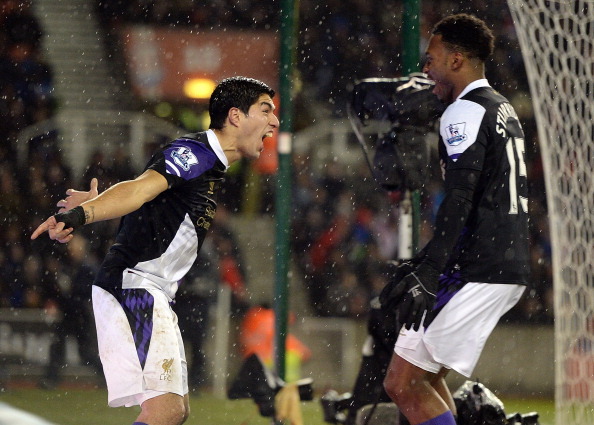 Liverpool’s Luis Suarez celebrates after scoring his second goal against Stoke City with Daniel Sturridge. At the end of 4 minutes of added time, with Martin Skrtel doing his best imitation of a pub bouncer to claw Jonathan Walters away from the ball, while Simon Mignolet pulled off an excellent save to stop his captain from scoring an own goal, there were countless Liverpool fans in the stadium and around the world shredding their fingernails. It was that kind of made-for-TV encounter that characterizes the Premier League: high on adrenaline, end-to-end running, goals and drama – with two former Liverpool men scoring against their old club and a controversial (though deserved) penalty for Raheem Sterling – but ultimately low on tactical nous and pockmarked by shoddy defending. Every time either side got the ball, there was a high probability that a run at goal would fetch a corner or a free-kick, and almost certainly leave a defender looking foolish. In the end, the side with the better attackers won. This is a far more aesthetic and visually-pleasing Stoke than we were accustomed to watching during the Tony Pulis years, but the loss of defensive solidity raises serious questions about their forthcoming league matches. It sums up captain Ryan Shawcross’ night that the least of his sins was the own goal that put Liverpool ahead. He went on to provide them a second with some bizarre defending, attempting to clear a bad back-pass by Marc Wilson, but poking his weak effort straight into Luis Suarez’ path. With the kind of form the Uruguayan is in, you could expect him to put these chances away ten times out of ten, and he did just that. Stoke fought back quickly, capitalizing on Liverpool’s own mistakes at the back to equalize by half-time. Kolo Toure failed to get goalside of Peter Crouch when Stoke attacked down the left flank, and the former Reds striker headed a cross into the top left corner of the net, giving Mignolet no chance. Five minutes later, another Red old boy, Charlie Adam, fired a blinder through Skrtel’s legs from the edge of the box, making it 2-2. Game on. The penalty Sterling earned ten minutes into the second half will be the subject of much debate, but in fairness Stoke defender Wilson should never have leg-checked the winger. Decisions these days seem to depend unduly on whether the player goes to ground or not, and while Sterling did so a little too quickly, his speed just before the nudge may have caused the fall. It was a tough call for referee Anthony Taylor, but it wasn’t a wrong one, and Steven Gerrard sent Jack Butland the wrong way to put his side back in front. It was perhaps Daniel Sturridge’s return that really changed the dynamics of the second half. He showed few signs of rustiness after a month-long injury layoff, quickly restoring his attacking partnership with Suarez. The duo’s speed on the break has made Liverpool arguably the most dangerous counter-attacking team in the EPL this season, and Stoke – forced to go on the attack after the penalty put Liverpool ahead – were often caught out on the break as they committed men forward. Suarez’ second goal – brilliantly assisted by Sturridge – should have settled the match, but there was still time for a defiant last act by Stoke. Jonathan Walters took advantage of some defensive hara-kiri in the Liverpool box to fire the ball past Mignolet, who really should have kept it out; but shortly after the restart Stoke were again caught on the break. Suarez played the ball upfront, where it was latched onto by the speeding Sturridge, whose shot was saved the first time, but then converted on the second attempt to mark an excellent return. Stoke can take heart from a strong attacking display and the grit they showed when 2-0 down – a comeback that would have sufficed for a point or more against most sides in the division. Liverpool for their part were far from assured at the back. Granted they were playing their third-choice Centre Back combination of Skrtel and Kolo Toure, but they got little support from Glen Johnson on the right, who looks more and more unfocused with every match and is probably overdue for a rest. They will take heart from their first Premier League win at the Britannia, however, and from the assured display of Daniel Sturridge on his return to first-team action.